From a regulatory standpoint, there are four ‘types’ of water: waste, drinking, bottled and sterile water – and each category requires a specific approach. I.G. MicroMed has a great deal of experience working with all. Waste water is discharge from a production facility, which must be tested to ensure that nothing harmful is being released down the drain. Drinking water is municipal (or tap) water for human consumption, whereas bottled water is legally considered a beverage and regulated as a food, but tested as water. 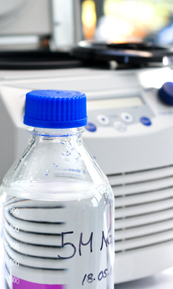 The main tests we perform on drinking and bottled water are for total coliforms, E. Coli and total bacteria, or we may be required to seek specific pathogens. We can also test for giardia and cryptosporidium. Sterile water is mainly used in medical procedures, or for military packs and civilian disaster/preparedness kits. We are also in the process of having our sterile clean room accepted for sterility testing. and food related products. We are a Provincially licensed laboratory for water testing.